The following extracts are reproduced with the kind permission of Ramanashram and taken from ‘The Poems of Sri Ramana Maharshi’ translated by Sadhu Arunachala (Major A.W. Chadwick). The first extract concerns the significance of the Arunachala Deepam beacon and the second extract is entitled the ‘Arunachala-Mahatmya’. This work was rendered into English by Sadhu Arunachala from Sri Bhagavan’s own translation into Tamil from the original sanskrit. One Deepam Day a disciple wrote the following and laid at the Feet of Sri Bhagavan with the request that he should write another verse showing the significance of the Beacon that is yearly lighted on the top of Arunachala. 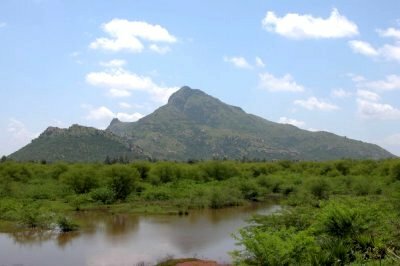 The Hill Arunachala is identified with the spiritual heart of creation of God. This appeared to the Gods, Brahma and Vishnu as a blazing column of fire. They wondered what it could be and started in competition with each other to find out its source. Brahma flew up as a swan and Vishnu started to burrow down in the form of a boar. But the search was endless. Vishnu came up again admitting his defeat. On his way Brahma caught a flower that was falling and taking it down to Vishnu pretended that he had reached the top and had there picked this flower. Suddenly Lord Siva, who had taken the form of the column of fire, appeared to them. He condemned Brahma for his deceit and said that as a punishment he should have no temple dedicated to his honour. As a reward for his honesty Vishnu was told that he should receive universal worship. Striving to reach the end of the column of fire signifies the search in the Heart for the realization of the Self and all the difficulties thus entailed. Bhagavan said in explanation that the ‘I’-sense was Vishnu and the intellect Brahma, they both turned outward and that is where they failed. Bhagavan used to declare that Arunachala was the spiritual axis of the earth. So definite was he that he once made someone get an atlas and see if there was not some other mountain, the other end of the axis, corresponding to this Hill on the other side of the world. Of all the spots on earth most sacred it. As the Aruna Hill beyond compare. Was Siva Ratri  in the Masi  month. The Siddha  , ‘tis that here I dwell for e’er. Is Supreme Glory, the world’s joy as well. Finite the worlds and egos can create. But think of it can easily attain. With the Supreme establish union will. Power of wicked people leaves no trace. Achieving nothing near this holy place. Of His dread wrath into the scorching light. Marga Sirsha (Sanskrit) = Margali (Tamil). Siva Ratri = the night of Siva. The fourteenth night of the dark fortnight of Masi or Magha. Magha (Sanskrit) = Masi (Tamil). Siddha could be translated Adept as it has the same two-fold meaning. He who has attained the spiritual summit of his endeavours, or again he who has attained wondrous yogic powers of a miraculous description. Here the meaning is the Supreme Adept, God Himself.